Kerry Hammond is here today to show us another way to enjoy Masterpiece Mystery! with a wonderful game inspired by the series and the Edward Gorey opening. I am a big fan of PBS’s Masterpiece Mystery! and all of its shows, such as Granchester, Sherlock and Father Brown. It’s one of the only programs where I won’t fast forward through the intro because I like to watch the animated Edward Gorey art with all of his creepy characters. 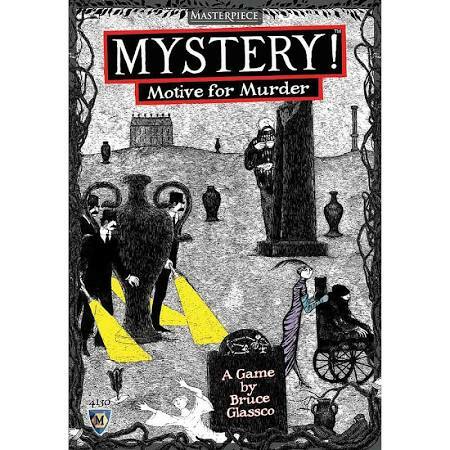 I recently found out that there was a Masterpiece Mystery! board game and I just had to have it. It’s called Motive for Murder, and here’s how it works. As with most mysteries, it starts with a body. One of the 22 suspect tiles is randomly chosen and placed in the center of the board. This is the body that has been found. Players then interrogate all of the suspects to determine who might have had a motive to commit the murder. There are 5 games and they get more involved and harder as you move from 1 to 5. Each higher game level introduces a new element, such as a second dead body, motive cards, detectives and second interviews. Points are earned for interviews and the player with the highest score is the winner. Since there are five versions of the game, you have the choice of starting with the easiest, No. 1, or jumping ahead to a more difficult, full game version. In each, players use interview cubes to interrogate suspects and score motive points. The cards all have beautifully drawn pictures by Edward Gorey and creative character profiles. One of the coolest things about this game is that there is a solitaire version for players who want to play alone. Whether you’re trying to stimulate your little grey cells or practicing to better defeat future opponents, this is another great way to enjoy the game.